Feeding carbohydrate-enriched diets to normal rats has been shown to induce insulin resistance and hyperinsulinemia associated with an elevation of blood pressure. 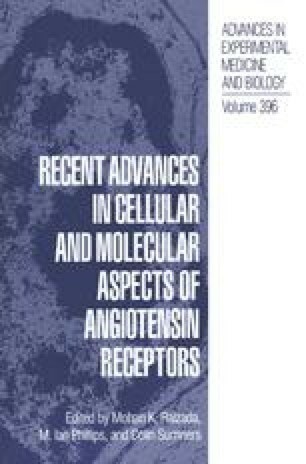 Previously we reported that the renin-angiotensin system (RAS) is likely to be involved in the elevation of blood pressure. The purpose of this study was to determine the changes in plasma angiotensin II (AII) and AII receptor density associated with the elevation of blood pressure in fructose-treated rats. Male Sprague-Dawley rats were divided into two groups and were fed either normal rat chow or a 60% fructose-enriched diet for four weeks. Plasma insulin of fructose-treated rats was significantly elevated (p<0.05) by the end of first week of fructose treatment and remained elevated throughout the study. Plasma AII levels of fructose-fed rats was 3.5 fold greater than the controls at the end of second week and returned to basal levels at the end of the fourth week of dietary treatment. Blood pressure was significantly elevated in the fructose-fed rats within two weeks of fructose treatment. Elevation of blood pressure was associated with left ventricular hypertrophy. Angiotensin II type I receptor (AT1) density was determined in the left ventricle, aorta, adrenal gland and hypothalamus. There was a significant increase in AT1 receptor density in the ventricle at the end of third and fourth weeks of treatment, whereas there was a significant decrease in the receptor density in the aorta at the end of the fourth week of treatment. Receptor density in the adrenal gland and hypothalamus of fructose-fed rats was similar to their respective controls. The results of this study suggest that the RAS plays a role in the elevation of blood pressure of fructose-fed rats and also contributes to the ventricular hypertrophy observed in these rats.